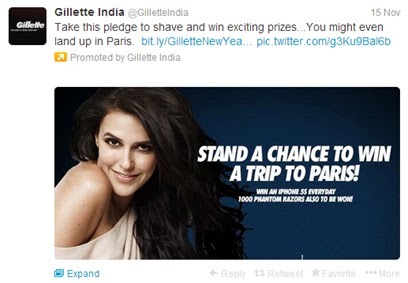 Gillette is taking to social media for the latest ‘New Year Resolution’ promo. A new Facebook application lets fans take the pledge to shave and also share it on their timeline. The brand is currently promoting the new Fusion Power Phantom range and this promo is also targeted towards the product. There are daily prizes to be won including iPhone 5S and Phantom Razors with the big prize being a trip to Paris! 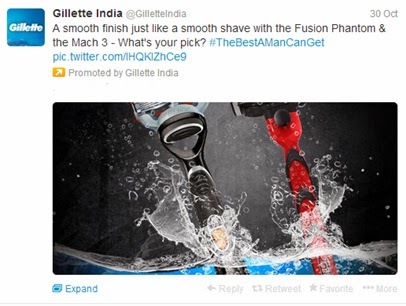 Gillette India (@gilletteindia) has been leveraging Promoted Tweets with brand images, once a fortnight to support the campaign. On a separate note, in my opinion Promoted tweets should always carry outbound links to the brand’s owned digital properties, in addition to the campaign communication. This provides a second layer of engagement in case the user is interested or looking for more information. I find way too many abrupt Promoted Tweets with just copy and imagery. These should be used as any other digital media placement, with clear end actions.